Periodontal disease is diagnosed by Dr. Nugent or your dental hygienist during a periodontal examination. This type of exam is done at a new patient exam and once a year for established patients. This exam is the ONLY way to determine the condition of your gum tissue. A periodontal probe (small measuring device) is gently used to measure the pocket (sulcus or space) between the tooth and the gums. The depth of a healthy pocket measures three millimeters or less and does not bleed. In normal brushing, the tooth brush bristles can get under the gum tissue up to three millimeters to swipe away food and bacteria. If the periodontal probe measurements are four millimeters of greater there is periodontal disease. As periodontal disease progresses, the pockets get deeper. The gum tissue is a nice pink color. The periodontal probing measurements are all three millimeters and less. No bleeding tissue upon probing. Gingivitis is the first stage of periodontal disease. Plaque and its toxin by-products irritate the gums, making them puffy, tender, inflamed, and likely to bleed. Because gingivitis is seldom painful, you can have gingivitis without even knowing it. There is a change in the color of your gums from a healthy pink to red. Plaque hardens into calculus (tartar). As calculus, plaque and bacteria continue to build up, the gums recede from the teeth. Thus, deeper pockets form between the gums and teeth. More bacteria are able to invade this pocket and normal tooth brushing will not clean out the bacteria. The gum tissue pocket becomes full of bacteria and pus. The gums become very irritated, inflamed, and bleed easily. Slight to moderate bone loss may be present. The teeth are dispossessed of more support as the gums and bone continue to be destroyed. Unless treated, the affected teeth will become very loose and will be lost. Generalized moderate to severe bone loss is present. 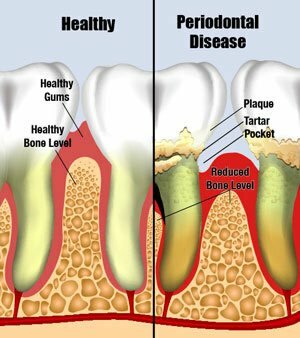 Periodontal disease progresses as the pocket (sulcus / space) between the tooth and gums gets filled with bacteria, calculus, toxins and plaque triggering irritation to the adjacent tissues. When these irritants linger in the pocket space, they cause damage to the gums and jaw bone. Soon the teeth become mobile and fall out. If the disease is fixed in the early stages of gingivitis, and no damage has been done, one or two regular cleanings will be recommended. Your Hygienist will give instructions on improving your daily oral hygiene habits and go over the benefits of electric tooth brush, flossing, water pick and having regular dental cleanings. If the disease has progressed to more Periodontal Disease, a specialized periodontal therapy called scaling and root planing (deep cleaning) will be recommended. It is usually done one or two quadrants of the mouth at a time. The area is numbed with topical or local anesthesia. Your Hygienist removes the calculus, plaque, and toxins from above and below the gum line (scaling) and rough spots on root surfaces are made smooth (planing). 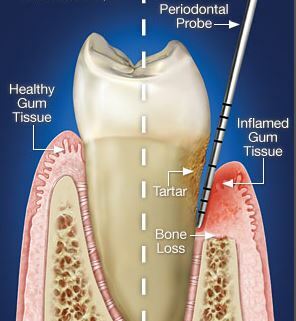 Scaling and root planing allows the gum tissue to heal and pockets to shrink.